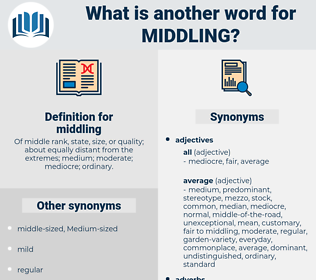 What is another word for middling? Of middle rank, state, size, or quality; about equally distant from the extremes; medium; moderate; mediocre; ordinary. extreme, abnormal, unusual, atypical, outstanding. excellent, refined, noble, cultured, sophisticated, high, aristocratic, superior. optimum, peerless, inadequate, individual, special, preeminent, A1, idiosyncratic, lacking, unparalleled, distinctive, unmatched, distinguished, strange, unique, private, optimal, supreme, wanting, matchless, first class, sensational, maximum. The great big bear went and stood at the head of the bed; the middling sized bear went and stood at the middle of the bed; and the tiny bit of a bear went and stood at the foot of the bed. I was middling small, with a square jaw, snub nose and sandy hair. modeling, mental illness, mutualness, mental anguish, mottling, metalanguage, modelling, meddling, monthlong, mental image.